Popping up on my radar in the brilliant musical comedy Pitch Perfect and following up with a sophomoric dud but relative financial success in 21 and Over. You would've expected better things from Skylar Astin, okay, maybe not. Unfortunately, in Cavemen, he takes a far step back as this romantic comedy fails to give you the feeling that love is in the air. 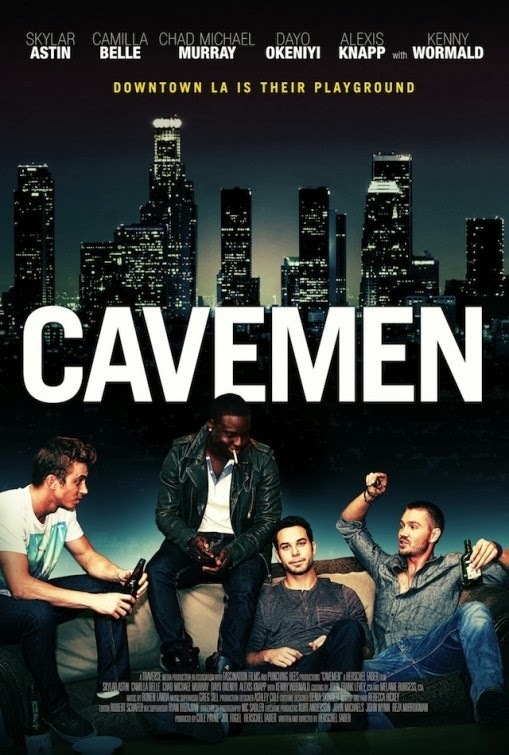 But what do you expect from a movie with the title of "Cavemen" when the majority of the movie is focused on the glorious conquest of Chad Michael Murray's character Jay and the soul searching of Skylar Astin's character Dean. The one bright side to this movie would have to be Camilla Belle as Tess. As the best friend of Skylar and the rest of the cave men, you can always see there's some chemistry there between the lead characters. When she's in the scene she literally lifts up Skylar capturing your interest again. Unfortunately, the film's focus isn't only about these two but rather takes a long road approach. If the final five minutes were kept and made into a short film, I would give it five stars. Unfortunately, you do have to sit through close to a hour and a half of Dean just walking everywhere as he is one of the rare few in Los Angeles that does not own a car. The audience gets the point after the first few minutes of this. But it's not clear until later what these tedious scenes are setting up. The characters and situations are quite predictable, from beginning to end. With drab dialogue and characters you're in for a long ride most of the way. Overall, I would recommend waiting for this film to come out for rental or Netflix. It tries to be a comedy and/or a romance movie but sorely fails on both end. There are bright spots here and there. For the comedy aspect, I enjoyed when Dean dates several women one after the other trying to find "love." However most of the movie, Dean tends to over think things leading to long dialogue to go with his walking all over town.